Empedocles (490 – 430 BCE) was from Agrigentum, a Greek colony in what is today the Italian Island of Sicily. As Italy looks like a boot, Sicily looks like a triangular rock being kicked into the Mediterranean by the toe of the boot. Both Empedocles’ father and Empedocles worked to overthrow the government of Agrigentum, which had grown abusive. Empedocles was said to have been a champion of the poor and an enemy of the oligarchs, the powerful who dominated politics. Like Heraclitus, he is said to have been offered the throne, and refused. He was said to have visited Athens, as well as Babylon and Persia seeking knowledge. His oratory skill was said to be unsurpassed. Aristotle called him the father of rhetoric. He had Pythagorean friends, and believed in reincarnation. He was also said to be able to cure diseases, as well as control storms like a wizard. Empedocles had a fantastic death. 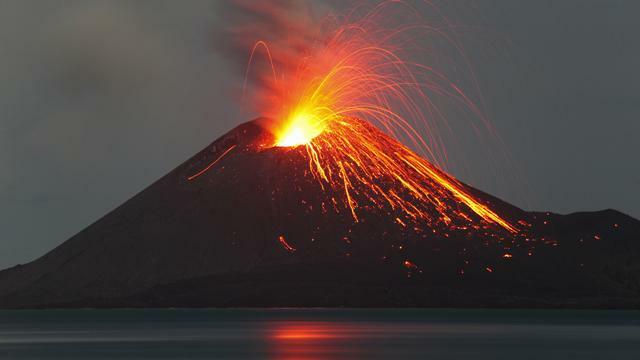 While some sources say he ascended into the heavens, others say he threw himself into a volcano, specifically Mount Etna in Sicily, to demonstrate that he had become godlike. Perhaps Empedocles was trying to out deus-ex-machina Anaxagoras. Diogenes Laertius says that Empedocles wanted to prove to the people of Agrigentum that he was a god or would be reborn a god, but the volcano spit back up one of his bronze sandals (I’d like to think with a burp) to show that Empedocles had been mortal and now was no more. Diogenes Laertius was clearly not a fan of Empedocles or his philosophy. A contemporary of Anaxagoras, Empedocles responds both to him and the Eleatic challenge of Parmenides. More of his work survives than any other presocratic philosopher. He was the last Greek philosopher to record his philosophy in verse, as poetry rather than prose, although Plato would continue to make art, namely theater, the medium of his own work. Empedocles seems familiar with the philosophical verses of both Xenophanes and Parmenides. Empedocles wrote a poem, On Nature, an overused title by this point (If I had a dollar for every ancient Greek Philosopher who wrote a work called either ‘Nature’ or ‘On Nature’, I’d have at least six bucks by now). Today we only have some of the first part of the work, called Purifications. In the very beginning, Empedocles says that he is no longer mortal but now immortal and walks among mortals as a god, praised and decked with flower garlands wherever he goes, curing diseases and raising the dead. Empedocles is said to have believed that the souls of all things (before inhabiting all things, as Thales originally said) were in a state of bliss before committing an unnamed crime and falling from grace into the mortal bodies of plants, animals and humans. Through morality and living a good life, we can become gods again, as Empedocles may have believed he had achieved. This sounds strangely like Scientology today. 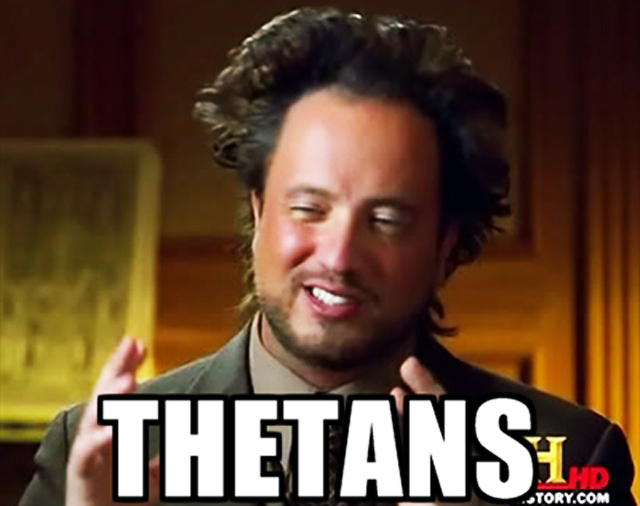 Perhaps Empedocles threw himself into the volcano searching for his fellow Thetans. Empedocles argues that the four elements fire, air, earth and water are the roots of all matter. They are unborn and undying. Empedocles identified fire with Zeus, air with Hera (wife and sister of Zeus, goddess of women, marriage and getting pissed at Zeus for cheating on her repeatedly), water with Persephone (who Empedocles calls Nestis, daughter of Zeus, queen of the underworld and goddess of vegetation and springtime), and earth with Hades (who Empedocles calls Aidoneus, king of the underworld). This would be quite orthodox along Homeric lines, except that for Hesiod it was Poseidon who was king of the water, and Zeus was king of the air, not fire. Hesiod does hold that Hades is lord of earth. According to Hesiod, the three joined forces to defeat the titans and take over the cosmos. Empedocles, in a Pythagorean gendering that departs from Hesiod, has fire upper male, air upper female, earth lower male, and water lower female, an opposed pair of kings and queens. Empedocles, unlike Anaxagoras, identifies the elements with traditional gods even as he departs from the tradition. Also, like earlier philosophers but unlike Hesiod, the gods are unborn as well as undying. Like Heraclitus, Empedocles places fire as king on top. Fire, air, earth and water are called the ‘four classical substances’ today, accepted by Plato and Aristotle, and with them the physics of European Christians and Middle Eastern Muslims. While the earlier Ionians were debating about these four, Empedocles is the first to say that all four are equally primary, even as fire is on top. For thousands of years, much of the world followed this formula. 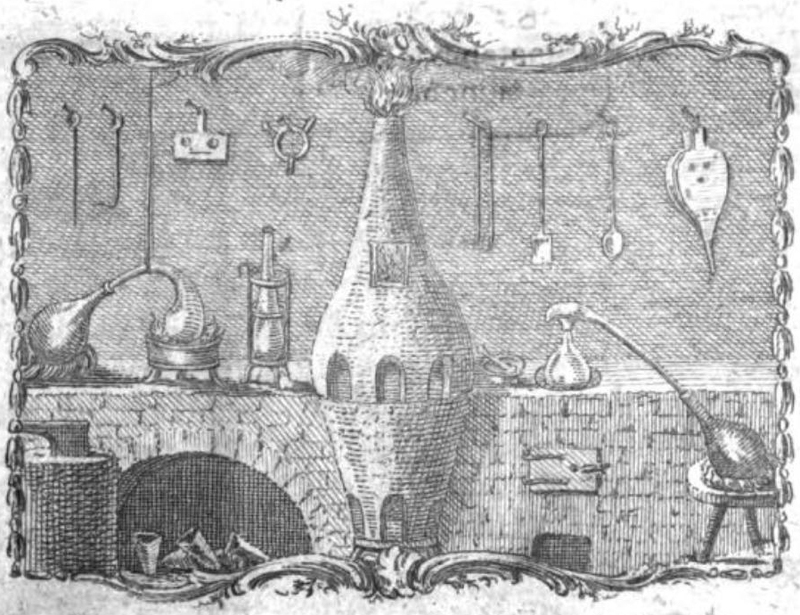 It was only in 1772 when the Swedish chemist Carl Wilhelm Scheele was attempting to experimentally prove Empedocles right that he accidentally isolated and discovered oxygen, which he called ‘fire air’. For Empedocles, love and strife are the two forces that order the cosmos, the love and strife of the gods who are the elements. Heraclitus has already said that war and strife are the “father of all things”, but he also believes that opposites are one and the same, so Empedocles is not far from Heraclitus’ position. Heraclitus also, like Anaximander, sees emotion and injustice in the process of the elements. Like Pythagoras, Empedocles argued that the universe was a sphere of spheres. Like Anaxagoras, he also said that in the beginning the elements were unmixed and the cosmos was a uniform sphere. Love and strife were in balance, with love holding the sphere together at the center and strife holding the boundaries apart from the nothing or chaos that was outside. Then strife gained in influence, not enough to disintegrate the sphere but enough to cause the initial separation of the four elements and then the mixture and stratification of the elements that became the many levels of mortal beings. As the cosmos works in cycles, love will again gain the upper hand and unite all things back into the original pure unmixed state, which will then again be mixed into a diverse universe by strife in the next round of the cosmic cycle. This is quite similar to the previously mentioned kalpa system of ancient Indian thought. As the world mixed and stratified, Empedocles said that there were cases of human arms and heads unjoined to bodies, and monsters of various sorts, part animal and part human. Like Anaximenes, Anaxagoras, and like Plato who borrows from both as well as Empedocles, the form of the human is pre-designed and latent, waiting for the cosmos to figure itself out such that it can emerge. 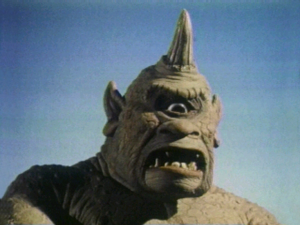 The historian Herodotus believed that there were dog-headed people and cyclops living in parts of India, explaining the various monsters encountered by Odysseus on his odyssey. Empedocles’ physics explains the Homeric monsters of the traditional mythology. Empedocles argues that human beings were formed from pre-human dual beings of both genders, much as the gods and goddesses were undifferentiated in the pure unmixed sphere. In Plato’s dialogue The Symposium, we will read that Aristophanes, the playwright as a character of Plato’s play, the same who lowered his own Euripides as a character into scene to mock the overuse of deus ex machina, argues that love feels like completion because early in the cosmos human beings were joined in pairs before being separated by Zeus, which is why heterosexual men and women find completion in each other and gay and lesbian people find completion in each other. This follows Empedocles’ theory, as love is integration of what was originally united but later separated, while further attempting to explain homosexuality. 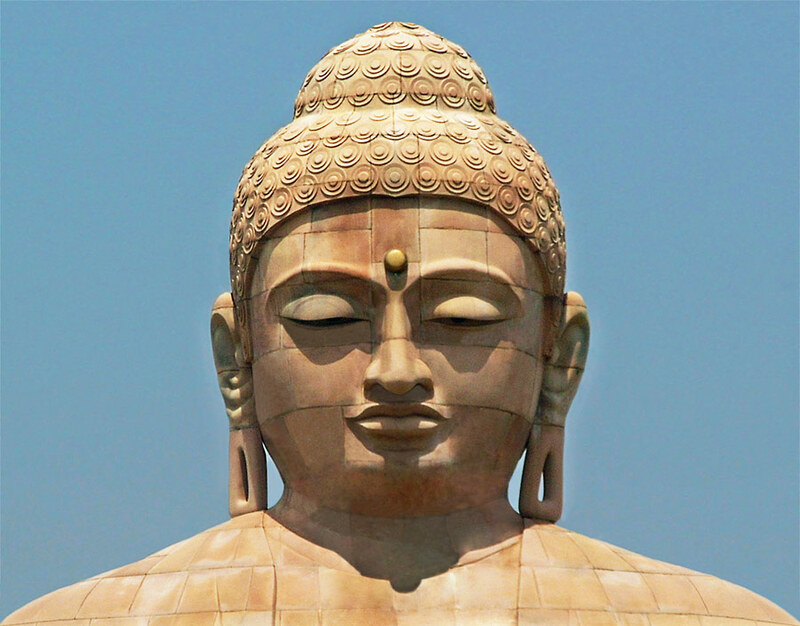 Buddhist thought also endorses the idea that all binding together in union is love, and all separation into division is hate, as our minds are the cosmos. To this day, psychology is still puzzling over the relationship between emotion and the basic cognitive acts of association and disassociation. It may seem odd to say that emotion may be at the root of doing all thinking and conceptualization, even supposedly ‘objective’ hard mathematics and physics, but consider that association (cuddling up to the familiar) and disassociation (Ahhh! Get it away from me!) dominate the animal mind and emotions were basic to the mammalian mind long before humanity evolved our complex problem solving minds. For Empedocles, like the Pythagoreans, souls reincarnate, and plants, animals and humans are linked in chains of life. For this reason, Empedocles promoted vegetarianism. Wicked people become animals (so, maybe we SHOULD eat them?) and good people become divine, much as Empedocles believed he had before hurling himself into the volcano. 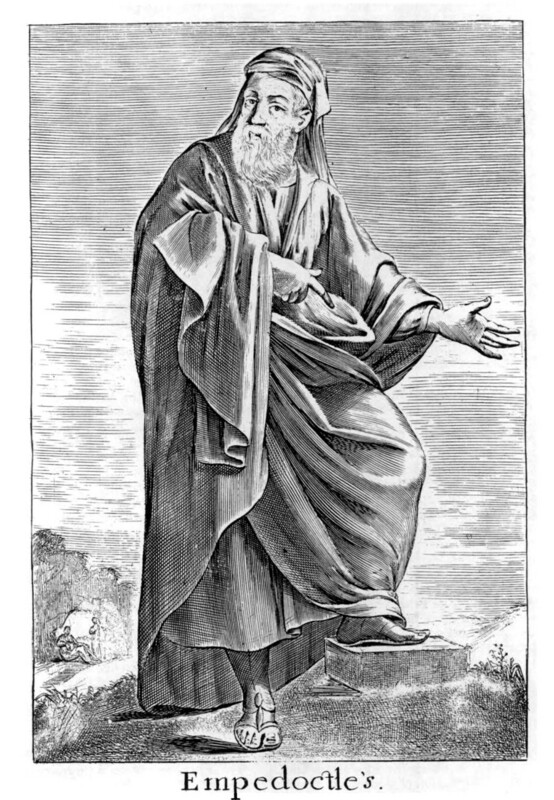 According to sources, Empedocles said that he had once been a daimon, a divine spirit, much like the daimon that Socrates told others he spoke to when philosophizing. As Christianity spread into ancient Greece, the traditional spirits were seen as evil, and so ‘daimon’ became the root of ‘demon’. Empedocles said that because he had eaten meat for decades in a previous life, he had been banished to the animal kingdom, but as Empedocles he was about to become immortal in the next life, having made up for his sins. If so, he believed that he would be reborn a god after emerging from the volcano. One Roman source says that Empedocles was reborn from the volcano, was shot into the heavens and now lives on the moon, subsisting on dew. If true, this would confirm the theory of Anaxagoras that the moon is inhabited. Similarly, Empedocles was a critic of animal sacrifice to the gods, which he believed was human sacrifice. He argued that in the glorious past, before the strife of his own day, people were wiser and gave the gods offerings of honey and grain, knowing well that reincarnation would bring terrible rebirths on those ignorant of reincarnation. 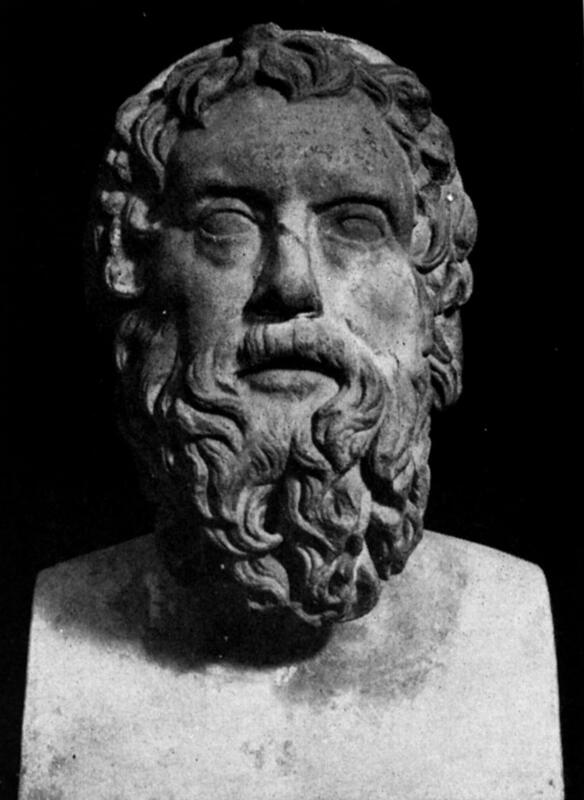 Similar to Anaxagoras, Empedocles argued that a warm uterus produces a male child, and a cool uterus produces a female. This explains why males are larger, darker in skin and harrier. The connections here remain unclear. Empedocles argued that light emerges from our eyes, presumably from the fire of the mind by which we imagine and conceptualize, and that this touches things and allows us to see them. For thousands of years, many bought this until Avicenna, the Islamic philosopher and doctor, demonstrated that light comes into the eye but not out of the eye around 1000 BCE. 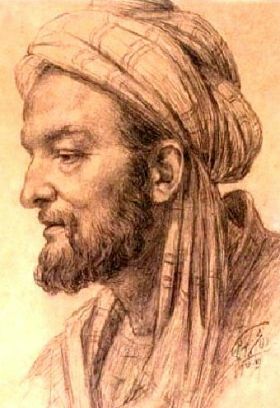 Avicenna questioned Empedocles’ theory, speculating that if it were correct, then we should be able to see things in the dark. 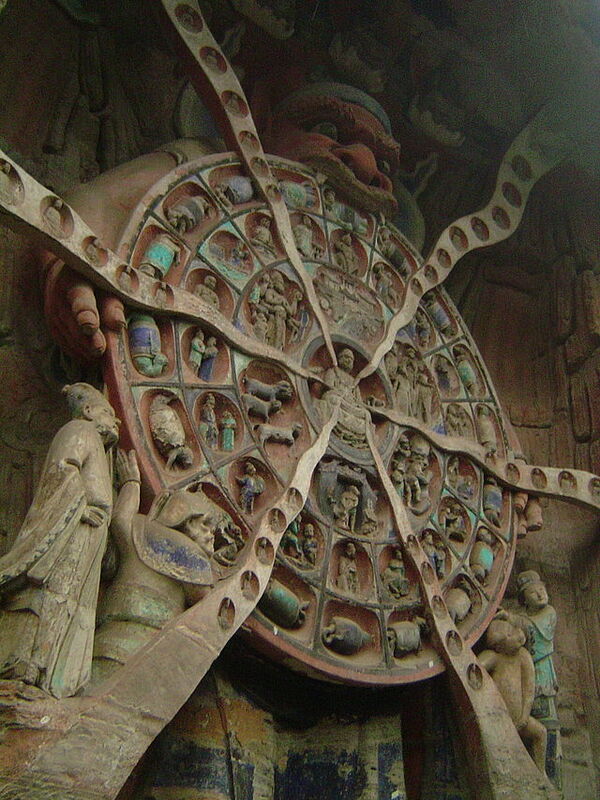 Empedocles argued that we can learn about things through perception, but we can only see one side of things at a time. With thought, we can put together the various sides of things to ‘see’ them as they fully are. Much as Heraclitus says about wisdom, which sees beyond the divisions of things by experts, Empedocles says it is the job of philosophy to integrate things into wholes, rather than merely carve them into parts. 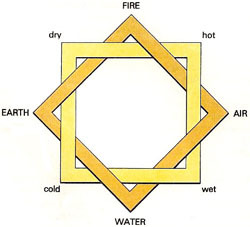 This corresponds to his cosmology, as everyone can see the differences between the four elements but only the philosopher can speculate about their origin and union. Recently, the French philosopher Badiou has argued a similar position, that the task of philosophy is to meta-critique systems of thought and culture by integrating what is often disassociated. For example, seeing science as political, asking where the money comes from or who in our society benefits from the funding, is the job of a philosopher of science, not a scientist. This is because the philosopher sees beyond the merely scientific and the merely political to ask questions about how the two are interrelated. While philosophy in medieval Europe was called the “queen of the sciences”, the most important science for understanding the others, most science majors today graduate without ever taking a history of science class or a philosophy of science class in addition to their science classes. This is good insofar as the biologist should concentrate on frog DNA rather than worrying about politics or finding new donors, but bad insofar as the members of the system are cogs in a machine that does not ask much critical oversight from them. Richard Dawkins, the scientist, author and prominent New Atheist, has argued recently that because science is quite accomplished today, we no longer need philosophy. 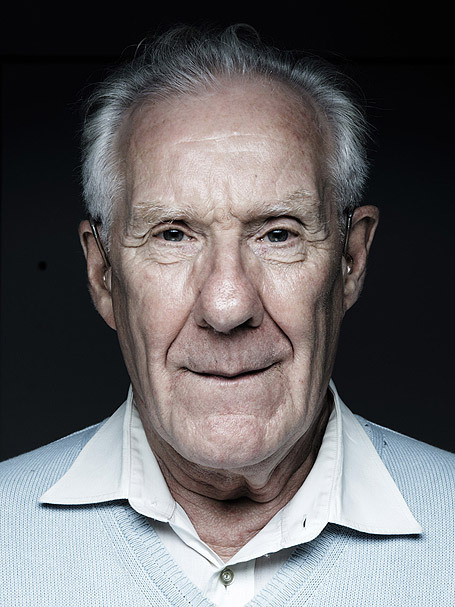 I side very much with Badiou, noting that for decades far more has been spent on weapons than on hunger. Consider that Einstein and Oppenheimer created nuclear weapons for the American military, believing them to be so horrible that they would never be used. After America used them on Japan, Einstein and Oppenheimer became two of the most prominent critics of nuclear weapons. 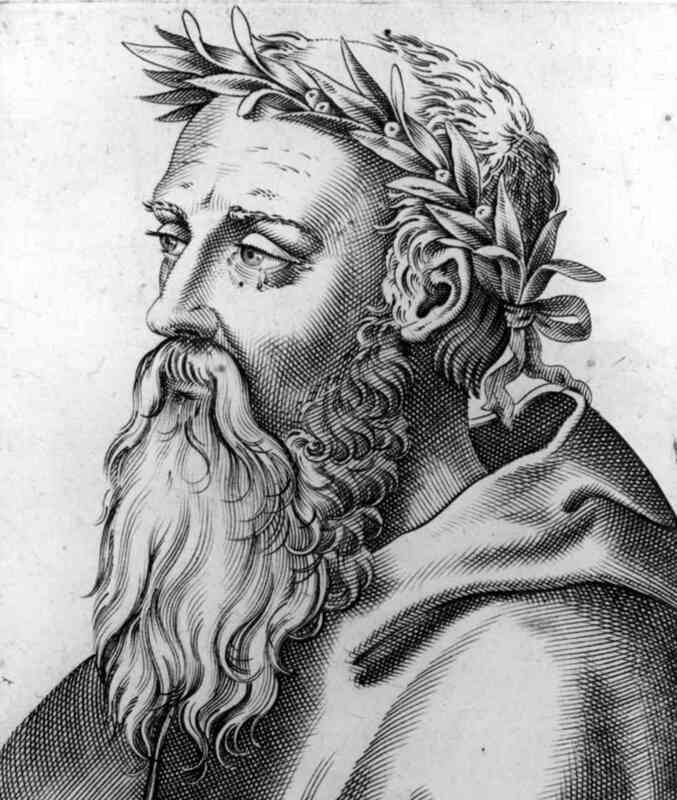 While science is excellent at supplying us with knowledge and technology, Heraclitus says that wisdom is the act of the mind that unifies all things, just as Empedocles says it is philosophy, the love of wisdom, which gives us the greater conceptions, the farthest views, the greater similarities and unities of things beyond their differences and distinctions.